Preah Khan temple is located 2 kilometers north-east of Angkor Thom on the Grand Circuit. Preah Khan temple was built in the second half of the 12th century in AD 1191 by King Jaya-varman VII, dedicating to his father Dharanindravarman. 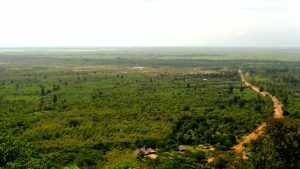 The Buddhist complex covers 56 hectares served as the nucleus of a group that includes Neak Pean and Ta Som, located 4 kilometers long Jayatataka Baray – the last of the great re-servoirs to be built in Angkor. The inscription indicates that Preah Khan was built on the battle site where King Jaya-varman VII finally defeated the Chams. 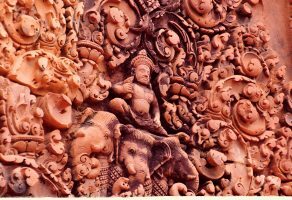 In those days it was known as Nagarajayacri which mean the city of Preah Khan. Four concentric ramparts subdivide Preah Khan. The outer or fourth wall, which is encircled by a wide moat, today encloses a large tract of jungle, formerly the living quarters of the monks, students and attendants of Preah Khan. 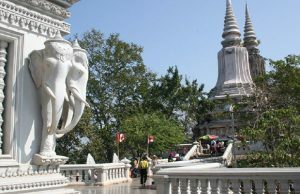 The second rampart delineated the principle religious compound of about four hectares within which there is a dense concentration of temple and shrines. The central complex is Buddhist. The northern and western sectors are dedicated to Brahmanism – Vishnu (west) and Shiva (north), whilst the southern sector is a place of ancestor worship. The eastern sector forms the grand entrance to the central shrine. 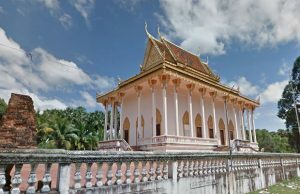 A place for a king located near Preah Khan temple is called Veal Reacheak or Preah Reachea Dak. It is 1,500 meters long and 1,200 meters wide. Nearby about 700 meters north of Preah Khan temple along the road to Angkor Thom district is another small temple called Ptu. The temple was made of laterite.